SHELBY  The flight attendants bracelet  Faith, hope and prayer for Natalee  caught her eye as Kelly Jones and her family headed to a tropical vacation in Aruba. I asked him where he got it and he said Beth was in the front of the plane  go ask her, Mrs. Jones said. 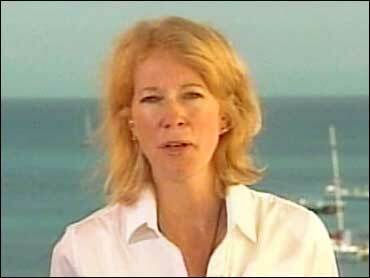 That was how she, her husband, Stephen, and his daughters, Natalie and Caroline, met Beth Holloway Twitty, mother of missing teen Natalee Holloway, who disappeared from the tiny island tourist spot on May 30. The Shelby family flew to Aruba on Wednesday, Aug. 3, the same day Ms. Twitty and a close friend returned to the island from a respite at home in Birmingham, Ala.
Ms. Twitty said she needed more coverage in what she called the seedier areas of the island, away from the usual tourist sites. Ms. Twitty, pursued by a CNN camera crew when she got off the plane, later waited at customs for the family, then agreed to meet them at their hotel, the Holiday Inn. Ms. Twittys brother, Paul, Natalees uncle, who was also staying at the Holiday Inn, provided a supply of posters, which needed updating with higher reward amounts. They were just a very normal family, just like you see her on TV, Mrs. Jones said. The search for Natalee Holloway started May 30, at the end of her high school senior trip to Aruba, an island in the West Indies just a short boat ride off the Venezuelan coast. In her hotel room, Natalees bags were packed for the trip home but she was nowhere to be found. The story made headlines and continues to get attention in papers and on television screens across the world. But not in Aruba, Mrs. Jones said. Mrs. Jones said they got friendly service at a small store where they bought tape for the posters. Then they asked to put one up. The clerk asked what it was for, and when they said, Natalee, the mood changed. You people need to give it up. Shes back in the States, they were told. With three scuba divers, the Jones clan likes tropical vacations, Mrs. Jones said. They chose Aruba this year because none of them had been there and because of low airfares. Those fares might have been affected by the publicity about Natalee, she said. After the negative response about Natalees disappearance from island residents, she said, I did have a little bit of guilt being there  then seeing this family and what they were going through  thinking that we were assisting in (Arubas) economy. I don't know when this picture of Beth was taken, but it is heartbreaking to see. Here's a link. On Thursday a witness that declared earlier that he had seen Joran van der Sloot on the night of the disappearance of Natalee Holloway did not show up in the Aruban court to testify. The authorities assume that he has already left the island. According to various reports the witness, a Colombiaan that is/was staying illegally in Aruba, had been summoned to testify on Thursday under oath. He told the police that he saw Joran on May 30th around 2.30 in the morning with the two Surinamese brothers in the neighbourhood of the Marriott Hotel. The Colombian was considered an important witness, because Joran declared that at that moment he was already at home. According to a lawyer of the Holloway family, Vinda de Souza, the judge can allow the previous testimony that the man gave to the police to be used as a valid testimony. The local media of Aruba is reporting that if the authorities dont come up with something incriminating on Joran van der Sloot by September 4th , he will be released.. Meanwhile the defence lawyers have appealed the judge's ruling that Aruban authorities can share information with the FBI after a motion by the defence to prohibit file sharing with the American law enforcement agency was struck down last week. Former official suspect, Deepak Kalpoe, claims that the mother of Natalee, Beth Twitty, has been harassing him. This after Twitty confronted Kalpoe at the Internet cafe and asked him about her daughters disappearance. That's gutwrenching. I'd like to put that picture on the wall of Joran's cell so he can look at it all day. Scumbag. This reminds me of the Greenwich murder case. The mother was very persistent and level headed in getting it solved, and she did, with Mark Fuhrman's help. The case stinks more and more each day. I have seen this institutional approach before, loud noises about doing something (Aruba authorities) while blocking every road to progress. My take? The kid had a line of credit at one or more casinos, but he was not old enough to gamble. I think he is mobbed up and the Boys Downtown are helping him. But the whole thing isis frustrating to me. Last night, I saw something on TV. It was very frustrating, when Ruben Trappenberg said something to the effect thatsomebody asked him about, well, you need to pay for all of the familys expenses. Oh, we are. You know, everything is comped, all the cab rides, all the hotels, all theeverything. SCARBOROUGH: So, is he lying? I cant tell you howabsolutely. They are not paying for all our things. And, yes, they have offered to help us with a couple of things, but they are not comping our rooms down there. I put Beth in a nice hotel because I wanted security in there, and the owner of the hotel was nice enough to come and give us a discount on the room, but they are not comping our rooms. Jug then went on to discuss how on earth that all of the families expenses are being covered when he certainly has a credit card statement to prove otherwise. Theyre not compingI have there in probably 70 cab rides. I have never had anybody offer me to give me a free cab ride. Its just unbelievable to even come and say that. And I have seen my credit card bills, if they want to pay for it. I dont want them to pay for it. I dont want the Aruban government to give me a penny. All I want to do is, I want to find Natalee and I want to go home. HOLLOWAY TWITTY: Well, all I was going to say, and there was also another false statement made that was by Ruben Trappenberg, the spokesperson for the government. You know, the FBI was not involved from day one, and it was only until my plea that came probably June the 5th that we began getting some response and some involvement from the FBI. But, you know, we had to pursue that ourselves and from supporters in the U.S. to be instrumental in getting that. And then, there were only in an assistive mode, remember, for many, many, many weeks, and basically up until justuntiluntil recently. And, still, I am not sure if they are much more into that unless now all the documentation, from videotapes, from audiotapes are being released. So, you know, that was a false statement. TWITTY: Joe, I would also say, its so frustrating to us, because, you know, heres the government down there. They are saying they are helping us. And I am sure they are, but when Ruben Trappenberg comes on there and says statements likethis was on another network or something the other nightthat they were complaining that the government wasnt helping with backhoes and things like that, and that EquuSearch and private investigatorsprivate entrepreneurs down there, like Jossy and people, were donating equipment. And Ruben Trappenberg come on and goes, well, you know, I dont know if the White House has backhoes in their backyard, but we dont have them down here. You know, what kind of statement is that? I mean, it just frustrates me to no end. Maybe Mr. Trappenberg would like to explain to us all how the Aruban Government owned landfill does not either own directly the equipment that works on the landfill property or at the very least contracts with equipment owners and thus that equipment acts as an agent of the Aruban government? Parsing words of whether the equipment is owned or not is irrelevant. The fact that at any given time they could have been asked to help searchers looking for Natalee Holloway in the land fill is. As this story has gone on and the many statements that have been made by Mr. Trappenberg have become more and more puzzling and to Natalees family obviously frustrating. Then this bit of information was brought to my attention regarding Reben Trappenberg. He has a Tickle site? You have got to be kidding me? A spokesman for the Aruban government has a Tickle site with a profile, how are we supposed to take this serious? More to the point, how does an official spokesperson for the Aruban government supposed to be taken seriously when of all things he has a Tickle site? To each their own but somehow the fact that the mouth piece for the government has one of these just seems inappropriate. I thought nothing more regarding this matter would amaze me, but I stand corrected. More of what Jug said in that interview is that Trappenberg snubbed them when they ran into him while doing interviews. He did not look at them, speak to them, or acknowledge them in any way. I think Trappenberg and Van der Straaten are two of a kind. I'd put both of them on the list of those involved in the cover up. When Beth returned to Aruba, she told Greta that she had a free rental car from a limo company. She said it was given to her for a month. I don't know why they need free taxi rides too. It also sounds like Jug has upgraded from the old room to a much larger one to accomodate security. The old one was given to them free of charge. I have only been following the Natalee case from afar...unlike those on this FR thread. I have one nagging problem with this case. Why have we heard so much about the VanDerSloot family....and barely anything about the Kalpoe family. I found that the Kalpoe brothers mother's name is Nadira Ramierz/Kalpoe...but I have yet to find any info. on their father....even his name. Mostly he is referenced as a "prominent" Arubian businessman. There is a reference to the Kalpoe families business connections with regard to the Texas search team trying to procure some excavation equip., and being thwarted by the Kalpoe connections. I just have a feeling that with the Kalpoe family having more to lose with having 2 sons convicted they have placed the blame on Joran and his family and are getting themselves out of this situation with barely a scratch. Why these two were ever released is beyond me. For those here on this thread...I am just curious if this avenue has already been divulged. The following excerpts are from the WorldJOURNIER web site. It seems that this site contains a listing of all the those involved...and a by date break-down of events. I have posted some of the paragraphs from this site that contained info. that I had never heard. For those who have been on this FR thread...just wondering if much of this is common knowledge...proven...or disproven. While snorkeling on 7-6 about a half-mile from the Marriott off Arashi beach, FORNARO discovered one bone in the ocean that she found between 2 large rocks. FORNARO describes the bone as being 3.5 to 5.0 long, larger at one end that was rounded like a bone joint, gray in color, and still had a whitish tissue that was still meaty and flesh-like that was still attached to the bone. When asked if she thought it was a human bone, FORNARO said, yes, she thought it was a humans bone because the bone had not been cooked nor barbecued like an animal bone might have been if eaten as food. FORNARO wrapped the bone in paper, but even wrapped in paper she described its smell as so pungently bad and so strong that she had to put the wrapped bone in the trunk of her car while she and her mother transported the bone to the ARUBA police station in Noord. When she gave the bone to someone behind the reception desk at the ARUBA police Noord station, the person who accepted the bone told her that the police detectives will be contacting her. On 7-13 while lunching somewhere, FORNARO noticed a Texas EquuSearch team member also lunching. FORNARO told the Texas EquuSearch team member about her finding the bone near the Marriott Hotel, she described the bone, and FORNARO said she had taken the bone to the ARUBAN police station in Noord and turned it over to the police. The Texas EquuSearch team member asked FORNARO to show him exactly where she found the bone, and FORNARO did so. While at the discovery location they also found a pair of thong underwear and a yellow-colored hair scrunchie. The same day the Texas EquuSearch team member asked FORNARO if the police had contacted her. When FORNARO said the police have not contacted her, the Texas EquuSearch team member asked if she would mind going to the ARUBAN police station at Noord and checking on the bone. FORNARO agreed. When she went into the police station and asked to speak with a detective about the bone she turned in, the woman police officer asked FORNARO (paraphrasing), Oh, you mean the two bones? As of 7-17 FORNARO has still not been contacted by the ARUBAN police detectives. Thanks TK!!! Nothing like the smell of a new thread. Hi FR_addict. Good catch . . . do you have a link for that? I may be wrong (and I'm usually wrong, har har), but I don't think they are complaining that Aruba isn't paying for everything. I think that what bothers them is that RT is making it seem that the Aruban gov. is picking up the tab, which is just not true. IIRC, I don't think they said anything about their accomodations until RT brought it up. Of course, I could be wrong about that too . . .
Also, they have already been in Aruba for over 2 months, so 2 months of taxi rides would probably be pretty expensive? I think? Never taken a taxi in Aruba, so again, don't really know . . .